But I like to learn to cook my own things, because The Todd does not like shrimps, cheese, mushrooms, and eggs, and thus he does not cook these things. My dish is loosely based on this Cooking Light recipe: Bucatini with Mushrooms. However, I don't use the dried porcini mushrooms or the bucatini noodles, so I sort of do my own thing with this, LOL. I also didn't have heavy whipping cream, so I just used half and half. And I hate sage, so no sage either. I told you this recipe was heavily adapted, ha ha. So here are some in-process photos. Upper-left: them are my mushrooms! I bought standard button mushrooms, some cremini mushrooms, and some big shiitake mushrooms. Upper-right: I sliced all my mushrooms and sauteed them in my pan with the shallots, garlic, and a little pat of butter. Lower-left: the mushrooms shrink down some as they get cooked. I cooked them for 5-6 minutes. 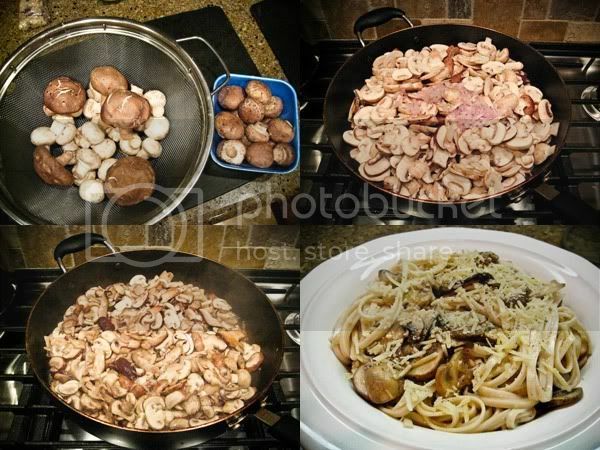 Lower-right: My finished mushroom pasta dish, with some parmesan cheese and fresh-cracked black pepper on top. Looks delicous, Christine, even without the sage. Now that's some serious mushrooms! It looks wonderful! I won't share what my sister calls Taco Bell. Let's just say, it doesn't agree with her and she feels like -something that rhymes with bell- after she eats their food. Yum Yum Yum. I love mushrooms and your dish looks amazing. I'm going to have to try this one.